Manchester United defender Phil Jones admits the team became a bit of a laughing stock under Jose Mourinho as he discussed the major improvement they’ve made in the second half of the season. The England international recently signed a new contract with the Red Devils despite some indifferent form down the years, and it seems he’s enjoying life at Old Trafford at the moment, as everyone else seems to be. Ole Gunnar Solskjaer has done a fine job since replacing Mourinho, with United now on a superb 11-game unbeaten run, which features ten victories and even a pretty impressive draw in which the team fought back from 2-0 down late on against Burnley. 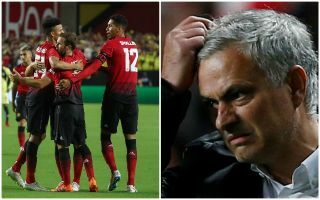 It’s clear Man Utd are back, at least for now, and Jones’ comments reflect that – they had become a bit of a joke under Mourinho this season, dropping points in winnable games and rarely putting in particularly convincing performances. ‘Everyone’s got to take us seriously now,’ Jones is quoted in the Manchester Evening News. ‘We might have been a bit of a laughing stock at the beginning of the season but we’re certainly not now.